Musical influence has never and can never be limited by the borders of nations. The far-reaching effect of the arts has created crossover music, with artists adopting elements of each other’s musical traditions. In the face of the president’s travel ban, Music of the Banned seeks to build a sonic bridge between individuals, cultures and nations. Organized by Iranian-born performer Dina Zarif, the concert series gives voice to musicians and artists from the "banned nations:" Iran, Syria, Libya, Sudan, Iraq, Chad, Yemen, Somalia, North Korea, and Venezuela. Love, peace, and empowerment is the message of the evening. Focusing on women artists, Her Banned Voice is the culminating performance of the Music of the Banned concert series. Within most banned Muslim-majority countries, exist bans prohibit women from performing solo, permitting them only to perform in ensembles or as backup vocalists. These restrictions cause many female singers to travel or emigrate to other counties to perform freely. However, with the current travel ban, female artists are not only prohibited from performing in their homelands but also banned from coming to the U.S. to pursue a music career. In this performance at Brava Theater, female artists—including Iranian singer Dina Zarif, Sudanese singer Salma El Assal, and Kurdish singer Rojan—will express themselves freely without limitations of religion, borders, and politics. They will also be joined by Venezuelan musician Jackeline Rago and her VNote Ensemble, bringing the audience the joy and beauty of Venezuelan music. There will be visual art exhibition at the lobby, by female artists from Iran: Mobina Nouri and Samaneh Salehi. Prior to the concert, please join us for a visual art exhibition in the lobby, with work by Iranian artists Mobina Nouri and Samaneh Salehi. 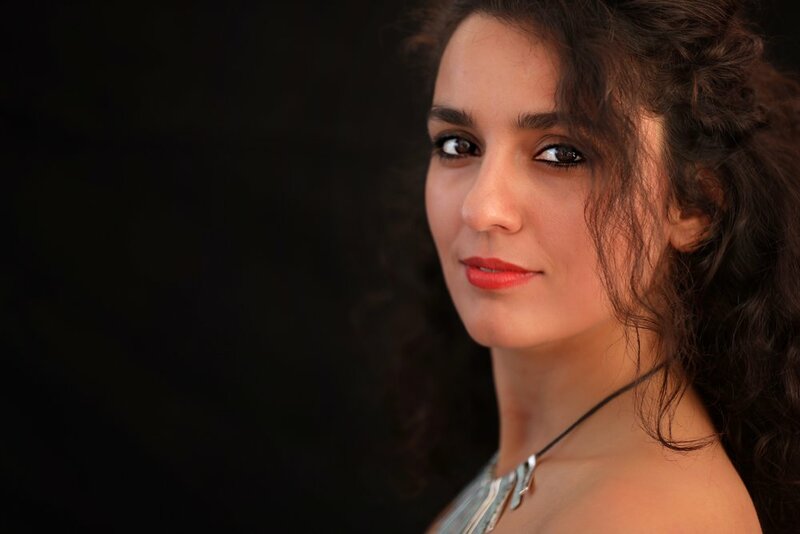 Dina is a performer, vocalist, designer, and art manager who combines Western classical singing with Middle Eastern styles inspired from her Persian roots. Some of her credits include SF International Arts Festival (May 2016 & 2018), Palace of Fine Arts (Sept 2018), the chamber opera The Passion of Leyla in San Jose, Yerba Buena Gardens Festival (June 2018), and the staged reading of Layla & Majnun at BAMPFA as part of the symposium with Mark Morris Dance Group and the Silk Road Ensemble. She was the featured singer in Syria Mon Amour, Golden Thread’s 2017 celebration of International Women’s Day at Brava Theater. As an actress, Zarif performed in three of influential Iranian playwright and director Bahram Beyzai’s plays: Ardaviraf’s Report (2015), Tarabnameh (2015-2016) as the role of Dancer/Singer, and Crossroads (2018) in the Stanford Iranian Studies department. She is also a costume designer and performer in the shadow production Feathers of Fire: A Persian Epic. As the character Princess Roudabeh, she has performed at SF Cowell Theater, Brooklyn Academy of Music, UCLA, Harvard University, the Metropolitan Museum of Art, Wallis Annenberg Hall, and has internationally toured in Poland, Canada, Taiwan, China, and France between 2015 and 2018. Zarif serves as Program Director at Red Poppy Art House. She received her MA in landscape architecture from the University of Tehran, College of Fine Arts. * Help support the mission and programs of Red Poppy Art House with the purchase of a ticket at this level.